Daffodils are blooming, the days are finally getting longer, and eggs are appearing in all form all over the county (Marmite flavoured chocolate anyone?). It can only mean one thing - Easter is finally here! Manchester is action packed this upcoming Bank Holiday, from carousels to racing rubber ducks, so grab your brolly, wish away those pesky April showers and get the whole family ready for many ‘eggciting’ days of fun! All through the Easter holidays, the intu Trafford Centre will be visited by a number of well known children’s characters, including PAW Patrol pups Marshall and Chase. They are also running a number of half-term workshops, such as their craft time, face painting, a 'shimmer and shine' beauty workshop and even a Teenage Mutant Turtle Pizza Party, so pop along to Trafford City at some point over the holidays. The People’s History Museum is also running a number of activities across the holidays. Inspired by ‘Never Going Underground’, an exhibition looking at the story of LGBT+ rights, The Rainbow Craft Table is giving you the chance to make your own rainbow dreamcatcher. Running for ten days across the Easter holidays and Easter weekend, there’s no excuse to miss the massive Indoor Funfair at Central Hall, Manchester Central. It will feature rides for children of all ages (including those who are still children at heart) such as dodgems, carasoluels, a soft play area and even a range of funfair stalls and games. One ticket allows you an unlimited amount of goes on the rides, meaning that even if the weather dampens, your spirits don’t have to. The Bank Holidays kicks off with the Manchester Duck Race on Good Friday. Now in its eighth year, hundreds watch as thousands of ducks race their way along the Irwell. Entry costs £1 and all the proceeds go towards local children’s charity Brainwave. There is also a petting zoo, a funfair and a mystery celebrity is expected to announce the winner. The Levenshulme Night Market has an Easter special this Good Friday. Featuring DJ's, an egg hunt and arts and crafts, this market is not one to be missed, especially for your tastebuds. There's poutine from insta-famous Blue Caribou, gourmet Mac and Cheese from MacDaddies and Italian street food, with more to be announced - just make sure you save some room for all those eggs you find! The Lowry Outlet MediaCityUK is transforming into an Easter Wonderland, packed with cute creatures, arts and crafts, real life hedge people, and a market over the Easter Weekend. There's face painting, a spring word trail map and floor art that you can interact with, offering hours of free fun for the whole family. 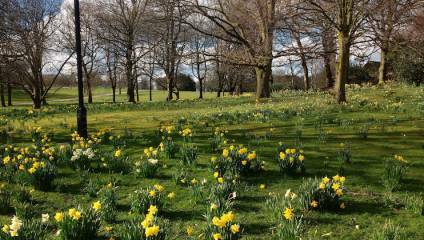 Easter doesn’t need to be busy to be great; Heaton Park, Fletcher Moss Botanical Gardens and Haughton Dale will all be in full bloom, so weather permitting grab your wellies and a picnic basket and enjoy the sights they have on offer. Who knows - you may even stumble across an egg or two! For more info head to Visit Manchester.